In a Monday Star Tribune article, “Buy local for the holidays, a group urges“, Minnesota 2020, a St. Paul-based think tank, advocates that shopping locally will strengthen our economy. 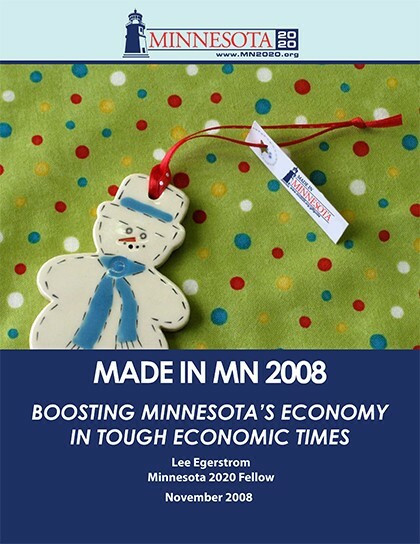 Their just-released report — “Made in MN 2008: Boosting Minnesota’s Economy in Tough Economic Times” — states that “if Minnesotans spent one-fourth of their holiday budgets on items made in Minnesota, more than $2 billion would trickle into the state’s economy”. The report repeats statistics long familiar to shop local advocates. In particular, they remind us that each $1 spent with a local, independent business keeps 68 cents circulating in the community, while only 43 cents spent at a national chain stays behind to boost the local economy. There are other benefits to shopping locally, according to the report. Buying Minnesota products reduces transportation and packaging costs, creates jobs, generates more tax revenues, and typically offers higher quality. Finally, clothing products are likely to be more appropriate for our environmental characteristics. 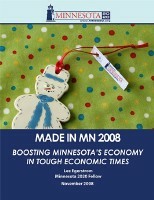 The report also includes a gift guide for shopping locally. It concludes, “When possible, let’s all look to how we can get the most bang for the buck this holiday shopping season”.